“Photos of Maggie Jeu and Itoria Ding” 1921, Chinese Exclusion Act case files, RG 85, National Archives-Seattle, Mrs. Jeu Ding (Maggie Jeu) and Itoria Ding files, Seattle, Box 1395, Case 41560/4-6 & 41560/9-3. 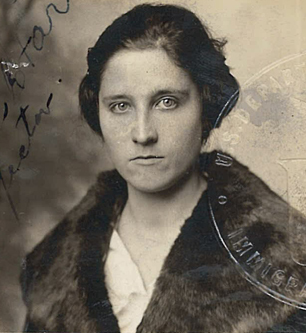 Maggie Lyle Jeu was a Caucasian American who lost her U. S. citizenship when she married a Chinese citizen. She needed to apply to the Chinese Consul-General for a Chinese passport before she could travel to China with her husband and two children. Her husband Jeu Ding, a Chinese-born merchant of Osceola, Arkansas, was exempt from the Chinese Exclusion Act because of his merchant status. He had made two previous trips in China as a merchant while doing business in Inverness and Benoit, Mississippi. He was the sole owner of his grocery business. He used his marriage name, Cheu Wah or Cheu Wah & Co., in his business. Jeu Ding’s first wife died in China. On 10 January 1918 he married Maggie Lyle, in Memphis, Tennessee. A copy of their marriage certificate was reviewed by the interviewer and returned to the applicant. 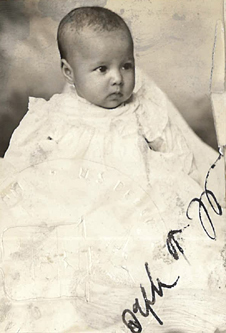 Jeu and Maggie Ding had two children, Mary Ding, age 22 months; and Iteria Ding, age 4 months. The 1921 White witnesses for the family were V. M. Rives, age 39; and Fred G. Patterson, age 50, both residents of Osceola for many years. Patterson testified that Dr. Dunnavant attended the home births of both children. Thank you for letting me know. I am so happy for you! Thank you for posting this. This is my Grandmother, no one has ever seen a picture of her when she was young. We were so excited to see this.